San Francisco Police Chief Bill Scott on Friday fired the rookie cop who, four days into his police career, shot dead an alleged carjacker. In return, the police union fired back a fusillade of its own, accusing Scott of cowardice and political expediency. Other officers — who would not speak on the record for fear of retribution from the police union — told Mission Local they backed the chief. One emphasized that cops must be held accountable for failing to follow procedures, including warning someone before shooting, and firing through a closed window. These are both directives Officer Chris Samayoa failed to follow. On Dec. 1, Samayoa — in just his first week in the job — was the passenger in his training officer’s squad car as they pursued Keita O’Neal into the Bayview. The 42-year-old was suspected of violently carjacking a van from a California Lottery official and leading the police on a serpentine chase. The pursuit came to a close on a dead-end street, at which point O’Neal, who was unarmed, leapt from the vehicle and ran beside the trailing police car. Without lowering the window or shouting a warning, Samayoa killed O’Neil with a single shot to the head, an act that was caught on his body camera. The SFPD confirmed that, on Friday, March 9, Scott “released” Samayoa — an act he is allowed to undertake unilaterally and for any cause, as the rookie was still in his probationary period. Calls and messages for Scott have not been returned. The San Francisco Police Officers Association (POA) on Monday assailed Scott in an e-mail to its membership, in the latest visceral denigration of the chief. Samayoa, per the POA, is a fluent Spanish speaker who graduated from Riordan High in 2008 and the University of Arizona, and put his master’s at USF in counseling and psychology on hold to join the department. He worked at the Edgewood Center with troubled foster youth and as a case manager with homeless families, according to the POA. 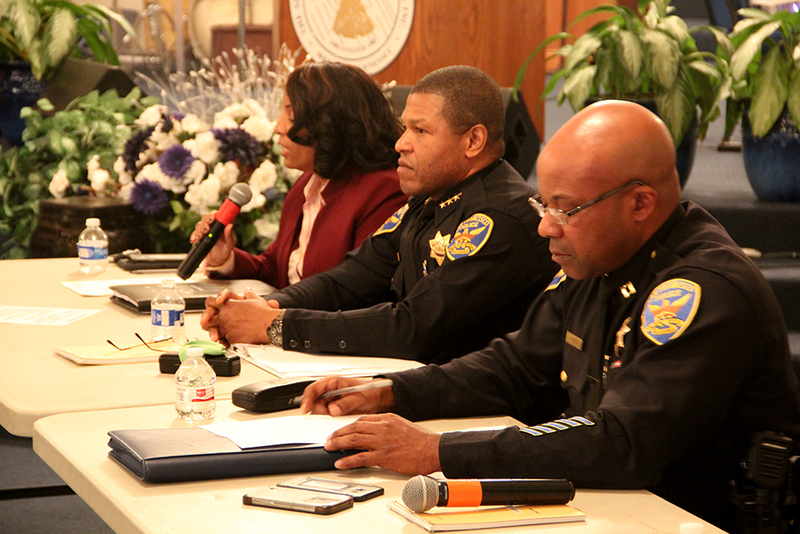 A number of police use-of-force experts, however, told Mission Local, the officer’s actions were troubling. Several noted that, when Samayoa fired the fatal shot, his fellow officers had yet to even draw their weapons. “That the training officer walks around and his gun is not out, it tells us something — it could suggest he did not perceive a threat,” Seth Stoughton, a professor at the South Carolina School of Law and a former police officer, told Mission Local in January. “If he did perceive an ongoing threat, his gun would be out and he would be cornering around the car more carefully than he does. Scott is entitled to fire Samayoa unilaterally, as he was just four days into his 12-month probationary period. Had he been a veteran officer, axing him would have required the Police Commission to act upon the recommendation of the chief. As an at-will employee, however, Samayoa’s options are more limited. “He has no recourse, really,” sums up Delagnes. He can demand a “Lubey Hearing,” as a dismissed probationary employee but, “he will most certainly lose,” the union honcho continues. Samayoa, Delagnes notes, is currently huddling with the POA to decide whether to file a writ with San Francisco Superior Court, to win back his job of four days. In further conversations with SFPD Officers, I have come to appreciate how this newly graduated officer Samayoa could have felt very afraid in the situation he found himself in. I would have been afraid too. While the carjacking that preceded this fatal and tragic encounter was a violent crime by force – physically throwing the victim out of her car – there was no indication that a weapon was shown or brandished. The threat of a weapon would certainly have make it much easier to convince a car jack victim to give up her car than physically forcing her from her car seat. Thus, based on the original crime that triggered the police car chase and attempted apprehension, there was no reason to believe that a weapon was present. I based these statements on SFPD’s own report to the community about this incident. Clearly, according the SFPD Department General Orders (DGO 5.01) on the use of lethal force, it is only justified to protect life – both officers and the community they protect. Fear alone without a reasonable justification to stop deadly danger is insufficient to justify taking lethal action. I do think that this entire tragic incident offers a good opportunity to instruct and learn better ways of responding to these dangerous encounters with those committing crime. I believe policing is a hard and dangerous job. It is one only few could do well. I couldn’t do it and I have great respect for those who can perform it well, which I believe are most officers.